Dragonborn DLC, SKSE, SkyUI Required. - Fixed gore piles and bones sometimes not cleaning up after a cell reset. - New Feature/MCM Toggle: Broken Heart, A hole will now appear where your enemy's heart once was. - Heart Rip script refined, if heart ripping animation cannot be triggered due to terrain, glitched side effects such as dropped weapons/explosions/added hearts should no longer occur. - Spell Power can no longer be used on the following NPCs: Miraak, Ildari, Ebony Warrior, and Tsun. - Fixed issue where Spell Power could be applied more than once, leading to every hit causing bleedouts. - Various scripting tweaks and refinements. - New installer that includes both Loose and BSA options. 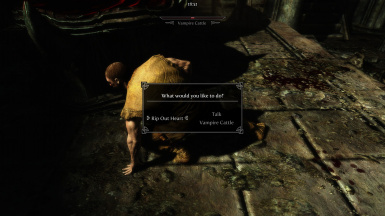 - New MCM Toggle: Vampire/Werewolf Mode, killmove may only be performed if you are a werewolf or vampire. - New MCM Toggle: Briarhearts Only, killmove may only be performed on briarhearts. - Ghosts no longer drop weapons regardless of the disarm toggle. 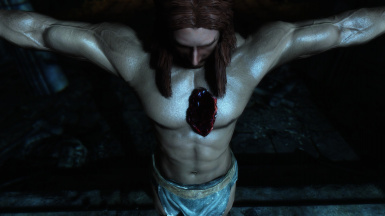 - Fixed Ghosts in Ysgramor's Tomb not using correct hearts. - Fixed a few of the defaults in the MCM. - New MCM Toggle Draw Weapons. If your weapons are drawn at the beginning of the killmove they will be automatically drawn at the end. - Heart support for Ghost NPCs. Ectoplasm will be added to your inventory instead of normal hearts. - Ghosts will no longer explode regardless of the Explosive Heart Breaker setting. - Changed Explosive Heart Breaker explosion visuals. - Added in a Z-Position check so that the killmove can't be activated if you are too far above or below an NPC. This should help keep the killmove from triggering without playing the animation. This problem is not completely gone, but it should be lessened. - Scripting changes to help alleviate Heart-Stuck-In-Hand bug caused by having a script heavy mod list. - If you were in first person view when you activated the killmove, you will be returned to that view when the killmove has completed. - Since hearts shown in the player's hand are equipped as armors using biped object 60, a small scripting change was needed to ensure anything that was already equipped to biped object 60 will be re-equipped at the end of the killmove. - New once a day Spell Power that enables you to hit an enemy into the BleedingOut state, allowing you to perform the killmove. - New Magic Arm option that comes with 4 different visual effects that are applied to your arm when you activate the Spell Power or perform the killmove. - New Disarm toggle causes enemies to drop their weapons at the beginning of the killmove. - Messages about killing essential NPCs and hearts being added can now be in 1st person, 3rd person, or turned off. 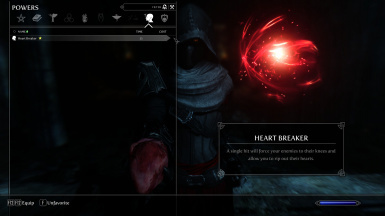 - Hearts in your character's hand will now visually match the hearts added to your inventory for Daedra, Briar, and Heart Stones. 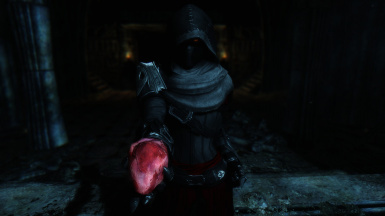 - All vampire hearts will now turn to dust in your hands and Vampire Dust will be added to your inventory instead. - Heart toggles have been removed and replaced with a Menu Option. - Explosive Heart Breaker toggle has been removed and replaced with a percentage slider, 0% is now off. 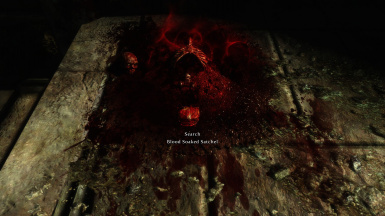 - Satchel left by Special Essential NPCs has been renamed to "Blood Soaked Satchel" and has blood soaked textures to match. - Satchel left by Special Essential NPCs will no longer sometimes flag all items in it as stolen. - Support has been added for General Falx Carius. If you perform the killmove on him, you will see the Heart Stone removed from his chest and added to your inventory. 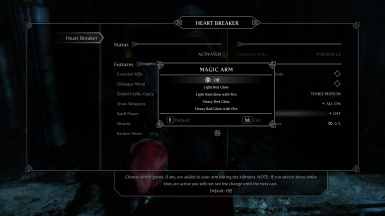 - Heart Breaker is now fully compatible with the original quest from which this mod is derived. The original killmove for the NPC will be properly played regardless of any of your settings in the MCM. I have also corrected a visual bug with the killmove on the NPC where the Heart Stone was removed before you actually pulled it out. - Support mentioned for the two NPCs was achieved without actually editing either of the NPCs themselves. - Changed MCM scripting for better updating. - Changed and updated the "Mod Active" toggle to properly turn off scripts when mod is deactivated for better uninstallation. - Added new toggle: Auto Shield Un/Re-Equip, shield will be Un-Equipped at the beginning of the killmove and Re-Equipped at the end. - Added new toggle: Explosive Heart Breaker, which causes NPCs to explode into gore upon having their hearts ripped out. - Fixed problem with Special Essential NPCs freezing in place, not dying, then going about their business. Special Essential NPCs will now explode into gore upon having their hearts ripped out. This will happen regardless of whether or not you have the Explosive Heart Breaker toggle on or off. - Small change to Essential Kills to fix Heart Breaker not killing Imperial and Stormcloak generals. - Essential Kills can now be toggled on and off. - Dialogue Menus can now be toggled on and off. - Built in Better Vampires support; just toggle Dialogue Menus on. - Hearts being added to your inventory can now be turned off. - Added new hearts for Khajiit, Argonians, Elves, and Orcs. - New hearts being added to your inventory can be turned off separately from vanilla hearts. - After using the killmove, Briar Hearts will now have holes where their hearts used to be. - Completely removed activation labels. - Can still rip out the hearts of orcs/elves/beast races, but you will no longer get a Human Heart. Turn Heart Breaker on or off and start/stop all scripts from running. Use before uninstalling. Perform the killmove on Essential NPCs and Special Essential NPCs. You will receive a message upon killing any Essential NPCs. Shows a menu that will allow you to select Rip Out Heart as an option when triggering the killmove. Automatically Un-Equip and Re-Equip your shield during the killmove. If your weapons are drawn at the beginning of the killmove, they will be drawn automatically at the end of the killmove. Adds a once a day Spell Power that allows you to put an enemy into the BleedingOut state in one hit. Enemy drops his/her weapons at the beginning of the killmove. Shows a hole where your enemy's heart once was. Killmove can only be performed if you are a vampire or werewolf in human form. Killmove can only be performed on Briarhearts. Messages you receive about Essential NPCs and Hearts added to your inventory can be in 1st person, 3rd person, or turned off. Choose which hearts, if any, are removed from NPCs and added to your inventory at the end of the killmove. Choose which glows, if any, are added to your arm during the killmove. Set the likelihood of enemy exploding into gore upon having heart ripped out. Use Mod Organizer, Nexus Mod Manager, or extract the .7z file and place the Meshes folder, Textures folder, Scripts folder, Sound folder, and the HeartBreaker.esp into your Skyrim\Data folder. 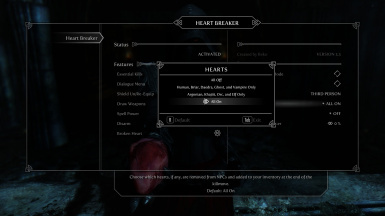 Enable the HeartBreaker.esp in the Skyrim Launcher under the Data Files section. You should overwrite all files when updating. 1. Deactivate the mod in the MCM. 4. Load save from Step 2. Stop here if uninstalling, if not...continue. 6. Install the new version you downloaded. 7. Load save from Step 5. 1. Mods that make you use the activate button on NPCs that are down on one knee (i.e. Bleeding Out), unless that mod has a dialogue menu that pops up first asking you what you want to do. If it does, then enabling Heart Breaker's Dialogue Menu option may allow you to choose between heart ripping and whatever the other mod does. 2. Mods that edit behavior files, which may cause the issue described in A4 in the FAQ to happen every time you try and execute the killmove. Q1: Are SkyUI and SKSE required for Heart Breaker to work? A1: SKSE and SkyUI are required for the MCM to work, and I highly recommend you use them. However, Heart Breaker will still function without them. 0 is Off and 1 is On. Note: In order to add the Spell Power, you must type help "Heart Breaker" into the console, get the ID, and add it by typing Player.AddSpell ######## into the console, replacing the # with the ID you got using the previous command. Q2: Why is the Dragonborn DLC Required? 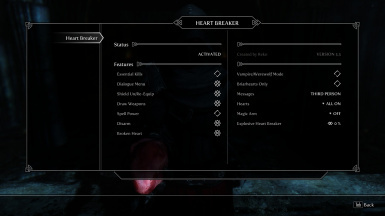 A2: The Heart Ripping animation is from the Dragonborn DLC, Heart Breaker uses that animation. Q3: Why did I end up ripping a heart out of thin-air? A3: If an NPC is too close to a wall, or has weird positioning relative to you, it is possible that the animation will play, but you will rip the Heart out of thin-air. This is also a problem with normal killmoves and there's nothing I can do about it. Q4: Why did the animation fail to activate? Why was I forced into third person? A4: As of version 3.3 this issue should be mostly eliminated. The animation may still not trigger due to terrain issues, however, if it does fail to trigger you will no longer be forced into third person, and you will not encounter any of the glitches that used to come with this issue. If you cannot seem to get the animation to trigger at all, 100% the time, then make sure to remove any mods that add the files defaultmale.hkx or defaultfemale.hkx. If that doesn't work, or you don't have a mod that adds those files, then try installing Dragonborn Animation Fix. Q5: What's the difference between Normal Essential NPCs and Special Essential NPCs? A5: Normal Essential NPCs can have their Essential Flag turned off while in-game, Special Essential NPCs are flagged Essential by Quests, and cannot have their Essential Flag turned off in-game. 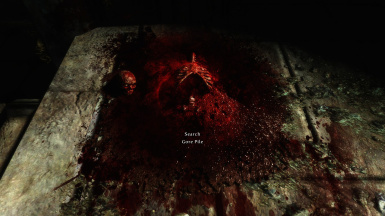 Due to this oddity, when Essential Kills is On, Special Essential NPCs will explode into gore even with Explosive Heart Breaker disabled, and leave behind a Bloody Satchel filled with items rather than the normal lootable gore pile. Q6: Why isn't Vampire/Werewolf Mode working when I'm in Beast or Lord Form? A6: Vampire/Werewolf Mode requires you to be in human form, not Beast or Lord Form. The skeleton for Beast and Lord form are different from the Human skeleton and therefore will not allow the killmove to work properly. Q7: Why does installing Heart Breaker make me crash to the desktop when starting up Skyrim? A7: You don't have the Dragonborn DLC installed. Q8: Why do I have a Heart stuck in my hand and how do I get rid of it? A8: This can happen if you have a script heavy setup, it shouldn't be a normal occurrence. To get rid of the Heart, Deactivate and Reactivate the mod in the MCM.